This was 2 weeks ago…we’ve grown! Sorry I haven’t written sooner, but it’s been really busy around here. I’m finally feeling back to my ‘old’ self and am trying to get things done that I wasn’t able to when sick. First off, last night was my knit group (Waterford-Area Knitters & Crocheters) and I must say…the group is really growing! We had 14 attending last night and ended up having to move to another location in the restaurant to get more chairs! It’s nice to meet all the new faces (3 new people last night) and greet people who have been away for awhile. It totally amazes me when I sit among these women and ‘observe’-there is so much diverse talent in the group: we have spinners, weavers, those who do Swedish weaving, felting (both kinds-in the washer and using ‘pins’), and also knitting and crochet of all levels from beginner to experienced. We must have had a good 4 pairs of knitted socks on display from some of our more experienced knitters; socks in every size and color AND degree of difficulty! All I can say is: I was totally ‘in my element’ enjoying every minute of the get-together. 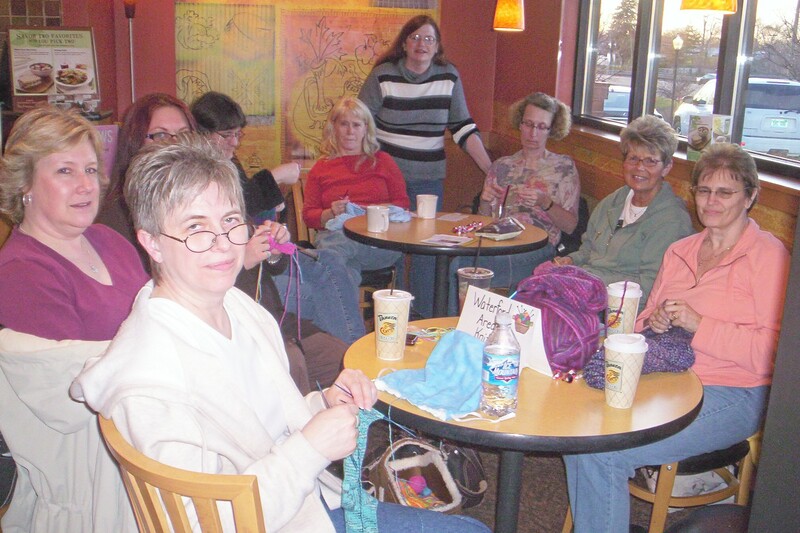 Now I can’t wait for 2 weeks to go by for another Knit Night to occur! Today I have my dear grandson with me and it’s been a week since I’ve seen him. It truly amazes me to listen to him talk and observe all he’s learning. We had the opportunity to see, close-up, a large semi-truck and he was in his glory being able to see it AND touch it! “BIG TRUCK! BIIIIIG TRUCK!” I love watching him grow; it’s a great blessing. He will be 2 in June and I really love this age, they absorb everything around them. 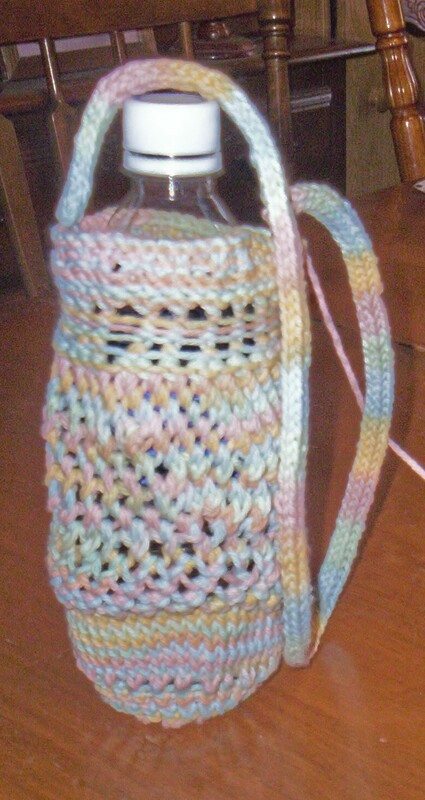 Next on the agenda is an unusual item: it’s a water bottle carrier (I’m almost done knitting the strap) for a friend of mine who just had a major surgery and needs to be drinking water every 15 minutes to keep hydrated. She’s in a wheelchair, so I was trying to think of a good solution for her to have water with her at all times when I remembered seeing a pattern on the ‘net for such an item. Mine is a bit different than the original but will serve the purpose, I hope. This was another “knit on 4 needles” project (and if it weren’t for it being a gift, I would have abandoned it long ago…my fingers are sore from trying to get all those tiny stitches on those nasty little needles!). I’m not done with the strap yet, hence the dangling string to the right; it’s knit out of dish cloth cotton, so it should hold up well for water and long usage. 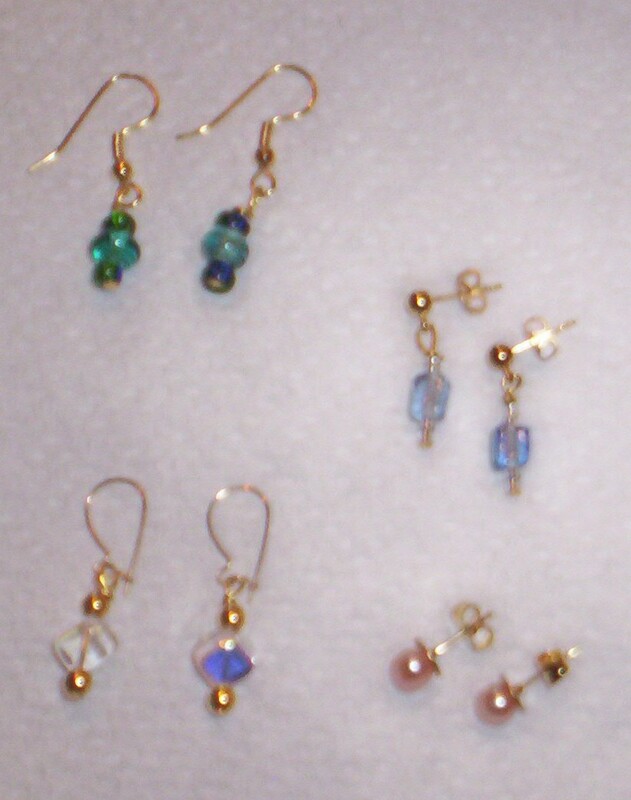 The top left set is made of green and blue ‘sea’ colored glass beads; the ones on the right are light blue and clear glass beads; bottom left are clear (sort of iridescent) cube-shaped glass beads and the bottom right are pink Biwa pearls. There’s just something about playing with beads, pearls, twisting wire, etc. that makes me happy. I don’t know why I don’t do it more often; I was a helper in a homeschooling class in jewelry making and came home with tons of great ideas, just haven’t used it as much as I thought I would. Our special needs adult Bible study group has now grown significantly (I volunteer with them every Weds. night) to where now we are over 50 ‘students’ and extra caregivers, and my partner and I. It’s amazing what the Lord does to bless this group; I would never have imagined it would grow this big back when I started with them in 1993. Back then we had about 10 ‘students’ and 6 leaders…amazing. Certainly keeps us busy! All around us there are wonderful signs of Spring in full bloom: my backyard has lovely bunches of daffodils, narcissus, hyacinth, ‘Star-of-Bethlehem’, and myrtle…as I’ve said before: I LOVE this time of year! It’s another gorgeous Spring day here in Michigan and I’m loving every minute of the sunshine and flowers bursting on the scene. Enjoy your day! After 3+ weeks of this virus/flu thing, I think I’m finally pulling through…YAY! Still have a little cough and drainage, but it’s going and I’m able to finally get things done like laundry, dishes, cooking, etc. Finally went to the grocery store today (and, of course, over-bought…everything looked so good! ), then had an appointment at the vet for our poor cat who’s been sneezing (10-12 times at a shot). Turns out the vet said that it seems he must have either inhaled something or has something stuck in his nose, but he should be Ok…kind of scary but I was so glad he didn’t have some life-threatening cat disease that sneezing was not so bad in the long run. It’s been a crazy week full of lots of ups & downs; a good friend went through life-threatening surgery and is now recovering-it was surgery or dying within a few months. A week of lots of prayer; another person we know is in stage 3 colon cancer, and one more is in the end stages of bone cancer…not pleasant. It makes a little cough seem like a walk in the park and has, once again, reminded me that each day should be very precious and lived to it’s fullest. I’m also guilty of not looking at life like that; days when you’re stuck in traffic, it’s hot and you’re tired, or someone pulls out in front of you almost hitting you (and vice versa) or things just don’t work out for you that day the way you’d planned…it’s ALL precious-both the good and the bad…they are all there to help us grow and learn. I’m guilty of ‘not being willing to learn from my mistakes’, which usually brings the problem back around, in another form, later for another go at learning from the trials. It’s been a week of lots of driving (again)-middle son’s car has been in to the Automotive department of his tech school, which means “Mom” has to drive him back & forth to school (40 miles each day), plus driving the youngest back & forth to school as well. I’m getting lots of squares knitting done while waiting for the boys so it’s not all wasted time. The tech school determined that his car is not as bad off as a local very well known car repair place said (they had his total estimated bill at $1,800!!!). The school told him that he can, indeed, keep driving his car and the wheels won’t suddenly fall off or the engine fall out (which is kind of what he thought would happen), so we were relieved. It seems there IS a leak in the transmission (which will cost $$$) but all is not totally ‘ready for the junk heap’, so we’re all relieved some at that. The weather is absolutely gorgeous once again; as I write it’s up to 79 degrees and very sunny with a light breeze…typical Michigan weather-it goes from 30 degrees (one day last week, complete with hail the size of ping pong balls) to this wonderful weather. I’m loving it-had to go try to find a lighter top to wear today as I was roasting in the turtleneck I’d picked out at 6:30 a.m. while getting ready to drive the boys to school (think it was something like 50 degrees at that time). OH! Almost forgot! 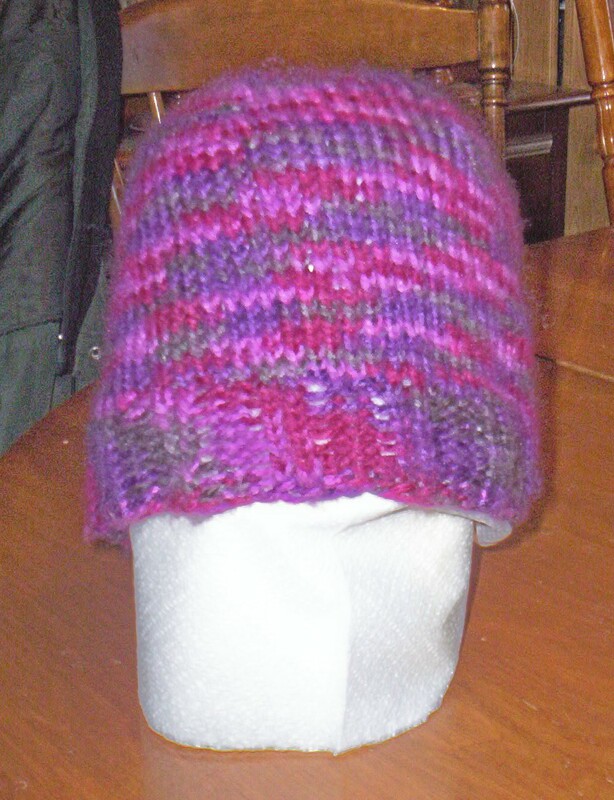 I tried something new…I knit a hat for myself; I’ve never done anything ‘in the round’ before, so this was truly an adventure. It didn’t exactly turn out like I’d hoped (it was supposed to be sort of like an oversized slouch tam) but mine didn’t have the extra ‘body/slouch’ part, so it’s kind of head-hugging. It’s not tight and would work OK, but I’m not exactly sure I want to attempt to plow through that pattern again any time soon. The pattern was simple, but the learning how to use 4 needles was crazy! (for those of you who know how to knit socks, I give you tons of credit…it would make me totally insane…way too frustrating having all those needles bumping into each other, stitches slipping off, etc…I’m sure if there had been anyone around watching me at the time they would have been in gales of laughter at my ineptitude!) IF I feel like braving it, I ‘might’ photograph the finished product…but then, maybe not, we’ll see. I was able to figure out how to adjust the pattern to make the ‘slouch’ part bigger, so that if I try it again it will do what I want…just not sure if I feel like battling those needles again any time soon. Like I’ve said before-life is a series of learning experiences…it’s HOW we learn from them that either makes or breaks us. (here I go waxing philosophical again…sorry). I KNEW there was one more thing I wanted to write about…my computer died earlier in the week! I attempted to turn it on and, before there would even be a display on the screen it would emit three quick beeps and turn itself off again. My husband did everything he could think of, including attempting to take it to the place that custom built it but we learned they went out of business. He was finally able to locate a place very near where he works and the owner was extremely helpful. It seems that the CPU had come loose, somehow (CPU=Central Processing Unit…basically the thing that runs the computer). The man tightened it back up and didn’t even charge a service fee! How’s THAT for service!?! My husband said we will definitely be giving him our business in the future! What a blessing! I’m very glad to be back up and able to send & receive messages (even if they ARE very LONG messages!). That’s what’s been happening around here lately. I’m planning on spending my Saturday just ‘vegging’ by sewing squares together…the weekend is here and I’m more than ready to RELAX! 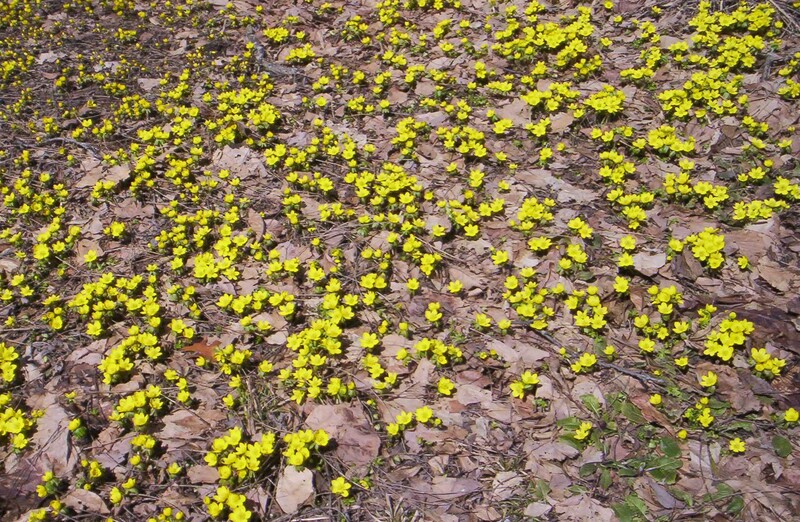 Aconite: a winter ground-covering flower. In my area, they are usually the first precursor of Spring! As you can see, we have SPRING in Michigan…finally! Today it is a glorious 74 degrees out, balmy and breezy, sun shining…just a perfect Spring day AND I’m finally feeling better, which makes it all the more glorious! Went to the Post Office today and picked up more knitted squares for the Ghana Project, then actually went grocery shopping (that’s just how good I felt!). Got home, put the groceries away and then finished photographing 228 squares from various donors, which are now in the “Contributors” section of the Ghana Project site. It really bothers me to not be able to post donated squares when they’re sent to me, but I’m sure those who mailed them understood that I was just too sick to accomplish that task, until today (Yay!). I’m planning on making homemade pizzas for dinner, in between resting up a bit while sewing more squares together. (Yes, I know my limits and also know it’s not good to over-do the first time you feel better after an illness…I can hear all you “Moms’ out there reminding me!). 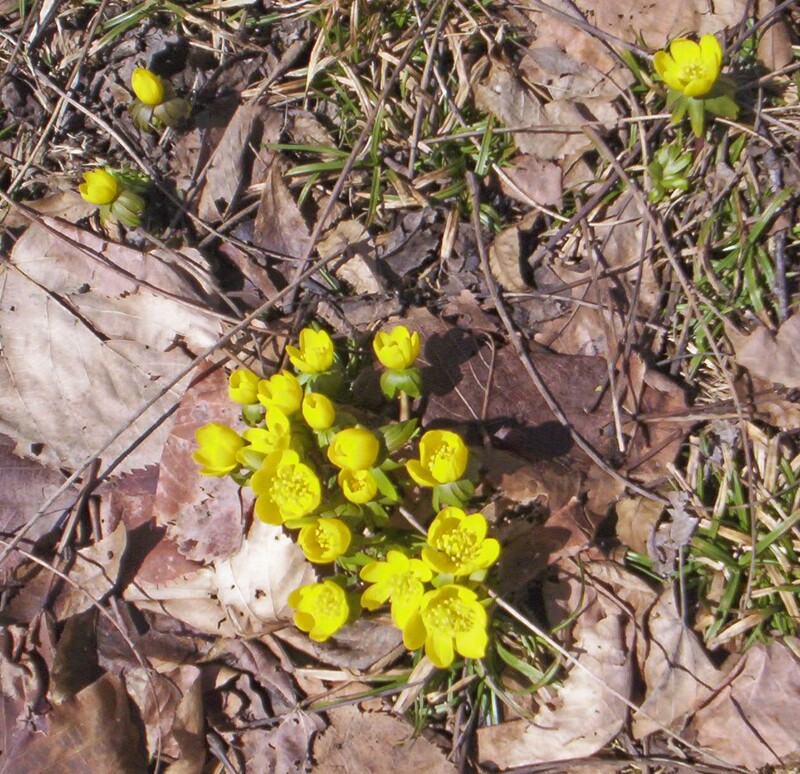 Just wanted to share the photos of the Aconite in our yard (which I took last week, actually). I love looking for it in Spring; it usually pushes up through the snow (we usually don’t have this early a Spring, so when it’s here, there’s snow on the ground). We also have crocus blooming, but my photos of them didn’t turn out as nicely as I would have wished. I just LOVE this time of year! Today while getting our mail from the mailbox I noticed we have a mated pair of Mallard ducks who’ve taken up residency along side the small stream that flows in the drainage ditch behind the box. (We live on a major highway and all of our mailboxes were consigned to a community box on a side street, within walking distance of our house.) It’s a joy to watch this pair of ducks sunning themselves, or sleeping in the shade or spritzing themselves with water from the stream; each time I see them they look like they’re really enjoying themselves…like this is the best day they’ve ever had! Made me think: that’s the way I should react to each day I’m given! “This is the day that the Lord hath made, we will rejoice and be glad in it.” Psalm 118:24. “Carpe Diem”-Seize the Day! Go out and enjoy this wonderful day! Am still somewhat sick but struggling to get my life back in order; still not sure if it was a virus or a bacterial infection – whatever it ‘was’, it sure knew how to ‘knock me down’! I’ve been resting and sewing squares together for the afghans, driving my boys back & forth to work and school, and trying to maintain what ‘once was’…my active life. Not sure yet if I’d doing a very good job of it, but life goes on, eh? Meanwhile, the wonderful boxes and bags of knitted & crocheted squares from others continue to come in; people are amazing. I still have several donations of squares to photograph and put on the “Contributors” section of the Ghana Project site…just haven’t felt well enough yet. I didn’t want this to turn into a ‘pity poor Pammie’ post, so I’ll close for now and, hopefully, the next time I write I’ll be back to my old, perky self! Enjoy SPRING! It’s a wonderful time of year! It’s been a rough few days here – I’m fighting a sinus infection; it hasn’t totally got me ‘down in bed’, but it sure is making me ‘drag my tail’ a bit. 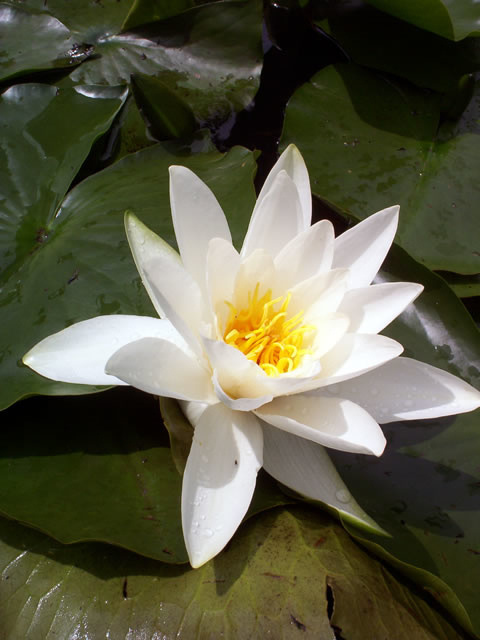 Had a blessing just a little while ago that I don’t have to babysit my dear grandson today; I was really hoping that would be the case – I just need one more day to rest a bit, then I should start feeling stronger. It seems that, even though you’re sick, life still revolves around you; I’m still doing the ‘driving’ for both sons – back & forth to school (40 miles a day; middle son’s car is on the fritz) and work, so just one day of NOT having to try to struggle with feeling nasty AND lifting the baby, is a blessing to me. 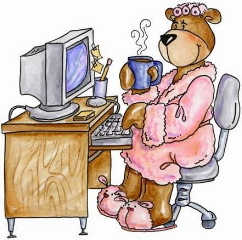 Will try to write again soon, as soon as I start perking up a bit. Didn’t want you to think I’d totally abandoned you!